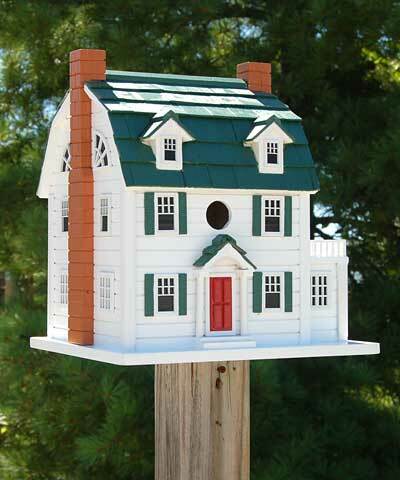 Invite birds to frequent your yard by placing the Home Bazaar Dutch Colonial Bird House in it. The gambrel roof, distinctive faux windows, and dual dormers lend a classic, familiar look to this unit, and its white and green colors offer a natural hint. Faux chimneys flank the home, their orange color contrasting the white siding and green roof. The generous home provides plenty of room for an avian family, and its bevy of window shapes enhances the spacious feel. A 1.25" diameter opening rests above the red door, for birds to easily access the home, and the gambrel roof overhangs this entry slightly to protect it from rain. This overhang also creates a ventilation gap on both the front and back of the home, ensuring it remains comfortable for nestlings. They may reach the top opening to exit the unit using the attached screening as a ladder, and the portico offers them a takeoff or landing spot. Two drainage holes on the base of the roost help any captured water escape the nest, and this significant platform also allows the item to be mounted to a post or pole with a mounting bracket (not included). The wooden construction enhances the classic lines, while the color scheme heightens the style. Place a timeless abode in your bird garden using this Dutch Colonial Bird House.